Taipei , Taiwan. – December 7, 2018 – Bointec ., a global brand in wireless networking solutions, today released the FreeRTOS wireless driver for its DFN105A “Smart-Ready” SDIO module based on the Qualcomm® QCA9377 chip. 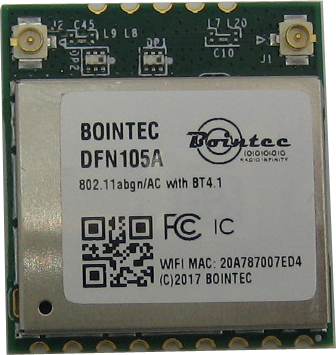 Bointec DFN105A is a wireless connectivity solution designed to deliver superior integration of wireless local area network (WLAN) and Bluetooth low-energy technology – engineered to support 1 × 1 802.11a/b/g/n/ac Wi-Fi and Bluetooth 4.2 + HS. This release offers “Plug-n-Play” solution allowing manufacturers to easily add Wi-Fi and Bluetooth capability to their NXP’s i.MX RT based devices. Robust connectivity is at the core of any IoT solution, and with this announcement, Bointec is taking an important step to support developers with the Wi-Fi and Bluetooth options as they need quickly and cost-effectively create new and exciting applications. NXP® i.MX RT crossover processors bridge the gap between microcontrollers (MCU) and applications processors. These processors bring applications processor-level performance into the MCU world to support real-time, performance-intensive processing functions. Bointec offers hardware and software for users to easily add 802.11ac wireless connectivity to i.MX RT devices that require high performance for their target applications. Dual-band 802.11ac + Bluetooth SDIO module delivering enterprise-grade Wi-Fi connectivity with link rates as high as 433 Mbps. It is easy to integrate and supports multiple software driver options including FreeRTOS for the i.MX RT series.